Victory came to the Medina Raptor Center from the Ohio Bird Sanctuary in Mansfield (Richland County) as a first year bird with an injured right wing. He was transferred from The Raptor Center to the University of Minnesota for his operation and conditioning. After six months, he was still unable to pass his “hunting test” for release and he returned to the Center in 2001. He has become a wonderful educational ambassador for his species. Powerful and fast-flying, the Peregrine Falcon hunts medium-sized birds, dropping down on them from high above in a spectacular stoop. Virtually exterminated from eastern North America by pesticide poisoning in the middle 20th century, restoration efforts have made it a regular, if still uncommon sight in many large cities. Black mustache mark on face. Back and wings bluish gray. Cheek area behind face stripe white. Underparts whitish with variable amount of black spotting and barring. Tail and under wings barred gray and black. Folded wings just reach tip of tail. Sexes similar in plumage. Female larger and more heavily marked. Juvenile similar to adult but back brownish and underparts streaked, not barred. Mostly birds, from songbirds up to small geese. Bats and other small mammals. Breeds locally from Alaska to Greenland and southward to Mexico, Missouri, and northern Georgia. Also throughout the rest of the world. Winters from coastal Alaska and southern Canada southward to South America. Found in a variety of habitats, most with cliffs for nesting and open areas for foraging. Uses large cities and nests on buildings. Searches from perch or while flying. Dives on prey from high above and strikes it with its feet, or pursues it from behind. Kills by biting into neck. Nest a shallow, unlined scrape. Placed on ledge of cliff or building, or in old raven nest. Reddish brown with darker brown blotches. Helpless, eyes open, covered with off-white down. Populations crashed in 1950-1970 because of DDT poisoning; eastern population extirpated. 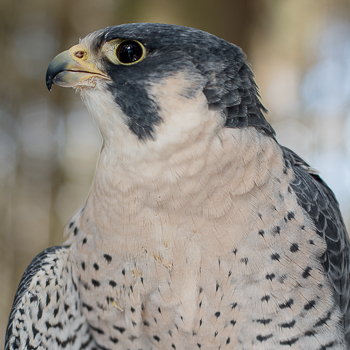 It was declared an Endangered Species, and extensive efforts were made to reestablish birds in East, beginning with the work of Tom Cade in 1970 at the Cornell Lab of Ornithology, which eventually developed into the Peregrine Fund. The species recovered enough to be removed from the Endangered Species List in 1999.